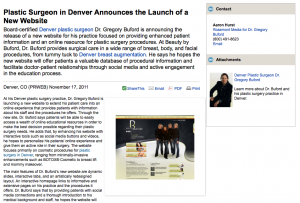 Board-certified Denver plastic surgeon Dr. Gregory Buford is announcing the release of a new website for his practice focused on providing enhanced patient information and an online resource for plastic surgery procedures. At Beauty by Buford, Dr. Buford provides surgical care in a wide range of breast, body, and facial procedures, from tummy tuck to Denver breast augmentation. He says he hopes the new website will offer patients a valuable database of procedural information and facilitate doctor-patient relationships through social media and active engagement in the education process. At his Denver plastic surgery practice, Dr. Gregory Buford is launching a new website to extend his patient care into an online experience that provides patients with information about his staff and the procedures he offers. Through the new site, Dr. Buford says patients will be able to easily access a wealth of online educational resources in order to make the best decision possible regarding their plastic surgery needs. He adds that, by enhancing his website with interactive tools such as social media buttons and videos, he hopes to personalize his patients’ online experience and give them an active role in their surgery. The website focuses primarily on cosmetic procedures for plastic surgery in Denver, ranging from minimally-invasive enhancements such as BOTOX® Cosmetic to breast lift and mommy makeover. The main features of Dr. Buford’s new website are dynamic slides, interactive tabs, and an artistically redesigned layout. An interactive homepage links to informative and extensive pages on his practice and the procedures it offers. Dr. Buford says that by providing patients with social media connections and a thorough introduction to his medical background and staff, he hopes the website will offer patients the opportunity to engage in a unique dialogue that will further communication between them and their surgeon. He adds that this exchange will enhance his ability to address patient concerns individually and achieve the best results possible. Dr. Buford developed his new website in collaboration with San Diego-based plastic surgery website design firm Rosemont Media as a combination of research-based procedure facts and relationship-driven interaction. He says that by opening up such a vast database of information, patients will be able to access valuable guidance in finding the right plastic surgeon for their specific needs. Located at 125 Inverness Drive East #200 in Englewood, CO, Beauty by Buford can be contacted at (303) 747-6719. The practice can also be reached online via the website beautybybuford.com or facebook.com/beautybybuford.